<b><i>Globe and Mail</i>, April 19, 1955.</b><br>Faster than a bicycle going downhill! More powerful than a butter churn! Spreads margarine on toast with a single stroke! It’s a bird, it’s a plane…it’s PARKAYBOY! <b><i>Toronto Star</i>, October 9, 1956.</b><br>Simpsons gets in on the colouring contest action with RCA Victor’s venerable mascot, <a href="https://en.wikipedia.org/wiki/Nipper">Nipper</a>. <b><i>Toronto Star</i>, November 21, 1956.</b><br>We (and Disney’s lawyers) can only hope that the actual drawing of Mickey and Minnie used for Dominion’s Ice Capades tie-in was superior to this spartan sketch. From a 1972 <em>Toronto Sun</em> colouring contest. From a 1972 Toronto Sun colouring contest. Before reading this column any further, grab the nearest pack of coloured pencils, crayons, or markers, or open up your favourite digital art program. Have we got a colouring bonanza for you! 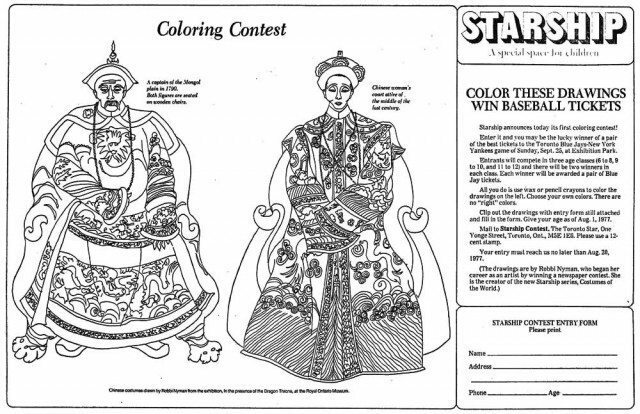 Long before adult colouring books topped the Amazon charts, and long before Russell Brand ranted about them, there was the humble colouring contest. It was a simple gimmick: draw interest in your brand, event, publication, or store by reeling in kids with promises of prizes if they applied their artistic skills (or lack thereof) to simple line drawings based on popular shows or seasonal icons. For their efforts, they might win pocket change, a bicycle, a chance to meet their idols, or bragging rights at the playground. Today’s gallery spotlights past opportunities to dazzle judges with your colouring skill. Let your creativity run wild!